The following guidelines cover both secure communications and development practices for secure applications. The SSL/TLS protocols are the basis for secure communications on the web. They are also under constant attack. Security experts try to stay one step ahead of cyber attackers by studying the SSL/TLS protocols for vulnerabilities. The POODLE and Heartbleed vulnerabilities were the results of such studies. To help keep your integration safe from current and future security threats, we recommend that you follow the best practices outlined below. Important: What happens if I don&apos;t do these things? Your integration with PayPal may appear to work today, but if PayPal decides to disable certain cipher suites or protocol versions, your integration may be at risk. More importantly, however, is that you may be compromising the integrity of customer data and ultimately your brand, so it’s best to revisit your integration with a security lens to ensure you’re secure! The public Certificate Authority industry is actively phasing out 1024-bit Root Certificates in favor of more secure 2048-bit Root Certificates. As a result, you will need to discontinue use of SSL connections that rely on the older 1024-bit certificates, such as the VeriSign G2 Root Certificate. For details, see the Merchant Security System Upgrade Guide and 2015-2016 SSL Certificate Change Microsite. SHA-1 is a 22-year-old cryptographic algorithm that is being threatened by increases in computing power. You need to transition from using SSL certificates that utilize SHA-1 to the stronger SHA-256 signing algorithm. For details, see the Merchant Security System Upgrade Guide and 2015-2016 SSL Certificate Change Microsite. Today all PayPal merchants should be using TLS version 1.2 or higher. TLS versions 1.0 and 1.1, as well as SSL versions 1.0, 2.0 and 3.0, are older protocols with known vulnerabilities that have been deprecated. PayPal is updating its services to require TLS 1.2 for all HTTPS connections. In addition, PayPal also requires HTTP/1.1 for all connections. For details about these requirements, see the TLS 1.2 and HTTP/1.1 Upgrade Microsite. Because Internet protocols change frequently in response to threats, we do not recommend that you hard code your integration to a specific version. Instead, we recommend that you allow the protocol to negotiate the highest version automatically. Ciphers such as RC4 and DES are widely used for TLS but have been shown to be insecure and vulnerable to attack. More advanced ciphers, such as AES and GCM, while among the strongest available today, may prove to be vulnerable in the future. Security exploits may cause PayPal to disable certain ciphers in the future. To minimize your vulnerability to current and future threats, we recommend that you do not specify particular ciphers in your integrations. Perfect Forward Secrecy (PFS) is designed to prevent the compromise of a long-term secret key from affecting the confidentiality of past or future conversations. We recommend that you implement PFS in your integration. With PFS implemented, any secure transmissions you have recorded in the past are still secure and cannot be compromised, even if a current key is compromised. The same holds true for future transmissions. Without PFS, if a single transmission is compromised, then all past and future transmissions could be compromised. When implementing PFS, you need to allow the protocol to negotiate the highest version of TLS and never use hard coded specific ciphers. When PFS is enabled, the TLS protocol negotiation is taken care of on the PayPal side. Be sure not to restrict Diffie-Hellman Key Exchange (DHE) or Elliptic Curve Diffie–Hellman (ECDHE) ciphers in your integration. 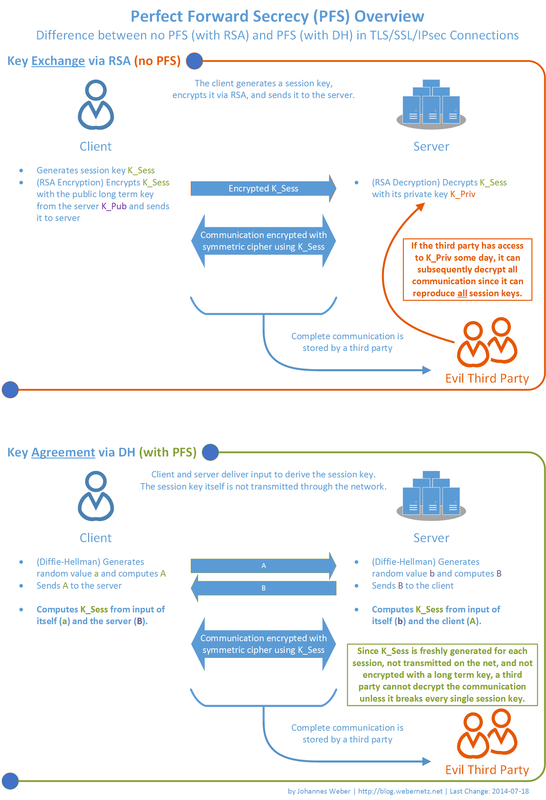 A visual representation of PFS can be found here: PFS architecture diagram. As much as we’d like integration to be a one-time, future-proof activity, the threat of cyber-attacks requires constant vigilance. PayPal is continuously working to protect our merchants and stay ahead of trends in Internet security. To reduce your vulnerability, be sure to check your integration against industry best practices on at least an annual basis. Following the minor steps outlined above can make a major difference to the security of your integration. To ensure the applications you develop are secure and also optimized for the best possible user experience, follow the best practices outlined in this section. Your application must not use a WebView or similar custom browser mechanism for display of PayPal web pages. Instead, use an appropriate PayPal SDK to manage the PayPal experience or launch the PayPal web page within the system browser or an approved browser-view mechanism such as Safari View Controller on iOS or Chrome Custom Tabs on Android. The PayPal platform enables developers to create applications that have the ability to make purchases on behalf of third-party customers, without the customers being redirected to paypal.com to complete the payment transactions. Such merchant-initiated billings for non-recurring/non-subscription payments include Adaptive Payments pre-approvals and Express Checkout reference transactions. Using pre-approvals or reference transactions can provide an elegant and seamless buying experience for the customer (they never leave the application or website where they are making the purchase). However, the developer of such an application must take into account the following Information Security Guidelines when they code an application that integrates merchant-initiated billing functionality. To use the pre-approval capability, applications must get the PayPal user&apos;s express consent for this "no login"type of payment. PayPal provides developers with the consent language during the application review process, or earlier (if requested). For details, consult the PayPal Developer Agreement. Authentication determines who is sending any given request for access to a system or application. For example, a customer can enter a user ID and password during login. Alternatively, authentication credentials can be retrieved by an application from a cookie or FSO provided during a previous session on the website. Below are PayPal&apos;s authentication requirements for applications using the no-login type of pre-approval capability. Generally, password length should be at least six characters, and contain at least one alpha and one numeric character, e.g. fr1gx9. Candidate passwords that meet these requirements should also be validated against a dictionary of common passwords, and a list of rules. For example, a candidate password of blink182 (the name of a musical group), should be rejected as being too common. Passwords that are the same as the user ID also fail a rules test. To ensure that no one can capture the password during login, it must be sent over an encrypted channel such as https. This prevents the password from being captured by someone listening on the network. Additionally, the password must be stored on the server in such a way that even internal employees with access to the database and encryption keys are unable to get the password in a clear text form. This is commonly done by hashing the password with a unique identifier or salt associated with the individual user. As stated earlier, the information stored within session cookies are generally used to authenticate each request to the web site. These cookies must be protected from hijacking by anyone able to listen on the same network. This is generally done by marking the cookie as secure so that it is only transmitted when connected to the site using https. To ensure that the computer has not been left for 15 minutes since the last time any action was performed and is now being actively used by someone else, it is required that a login be presented before performing a PayPal transaction if the session has ever been idle for 15 minutes. Typically, this will require collecting metadata about logons, logging them into a central log store, and then performing real-time analytics against that data. If a brute force attack is detected, a strong CAPTCHA (resistant against machine/scripted attacks) would be switched on. There are other implementation techniques, but this is the least invasive from a user experience perspective. Note that this is conceptually and functionally different from A6. Consideration must be made for users who have signed up for higher levels of authentication on their PayPal account, and these users must still be able to logon properly, if required. An example is the PayPal Security Key that requires the entering of a one-time use password. All versions of the SSL stack are insecure and should not be used, instead the newer TLS protocols are recommended. This is simply a requirement because of the standard cookie/domain binding rules, which mean that many parts of a large application have visibility into the cookie set, which can cause security risks. PayPal has expended significant energy in combating miscreants who send emails to unsuspecting customers claiming to be from PayPal with links to malicious sites that look like PayPal. These sites will trick the customer and capture the login credentials and at times steal financial and personal information. In order to allow customers to verify that they are truly connected to the partner site and to encourage general good practices, login credentials must be collected on pages that are https enabled, and using Extended Validation (EV) certificates. PayPal uses multiple techniques for identification of spoof sites being used to support various forms of phishing. Once identified, the sites are proactively shutdown to prevent continued risk exposure to our customers. In order to ensure the end to end security of the model, the partner must also implement monitoring and site takedown activities. These sites should be verified manually that they are in fact spoof sites; once verified, the URLs should be sent on as rapidly as possible to industry blacklists, such as APWG&apos;s, MarkMonitor, and so forth. Contain appropriate framework components that ensure the site is not subject to cross site scripting (XSS) attacks. Contain appropriate framework components that ensure the site is not subject to cross site request forgery (XSRF) attacks. Be tested periodically using either a commercially available tool, or a commercially available service, to demonstrate that it is not vulnerable to either XSS or XSRF attacks. In any case, the site should be tested as new code is deployed. There must be a vulnerability management process, by which the infrastructure on which the site operates is managed. There should be a feed of vulnerability information from one or more reliable sources (e.g. IT-ISAC, iDefense, Symantec, etc. ); the data from that feed should be reviewed to determine which vulnerabilities are even relevant. Vulnerabilities should be categorized by criticality, and the relevant patches applied based on that criticality designation. Similarly, there must be a process by which vulnerabilities in application libraries should be managed, and the application rebuild / release process prioritized. There must be a secure development process, which describes the standards that help make the site secure, and all relevant staff (which need not be all developers) should be trained on secure development techniques. There must be a way by which the site security process can be demonstrated to be working. This could occur through the use of industry standard reviews, such as PCI, auditor-driven reviews such as SAS/70, or commercial reviews such as the Cybertrust certification. PayPal may ask that particular content or features be added to specific webpages, in order to help detect fraud. In general, these requests would involve technical changes that would be "lightweight" to achieve. However, we can&apos;t determine whether such changes would be needed until the product is in some kind of production deployment and potentially under attack by fraudsters. As PayPal continues to improve the Pre-approved Payment Product, the partner will implement the enhanced product version in a timely fashion. In the future, PayPal may enhance the Pre-approved Payments Product with a redirect to paypal.com in order to run risk and security checks; this redirect should normally be transparent to the user unless PayPal risk controls are triggered.